Effect: Working of the planchette board. Four persons, one among them is the spirit medium, touch the planchette (ouija board) lightly on four sides and concentrate on the spirit to come and give an answer to the question. Suddenly the planchette starts moving and it gives an answer. Method: While concentrating, the medium assists the volunteers to concentrate and the more intensely the thought-process is directed towards a specific idea or physical part, the involuntary muscular movements make the planchette move and give you the answer to your problem. Explanation: Whatever action we perform is controlled by the brain. If we have any thought or idea in the subconscious mind, when we concentrate on the same, it manifests as a physical activity without any conscious attempt by the person. This is called idiomotor response. The minute electrical charges in the brain transmit to the muscles through the nerves. The persons who create motivating force through idiomotor response do not have any idea that they are the cause. It is these involuntary muscle movements, which cause the water divining stick to revolve and the planchette to work. 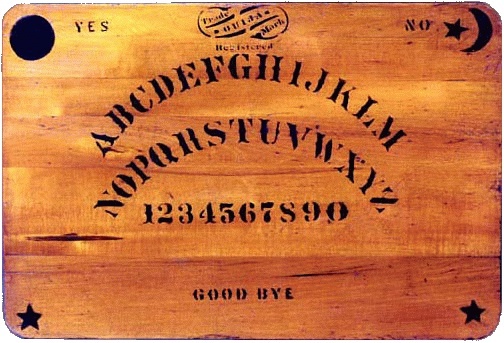 Strangely enough, in 1991, In Europe, I was introduced to Ouija. During one of my first session, the planchette started writing "Carvaka" and other Indian names, related to very specific questions. It was not before a decade that I found out the meaning of these words... Thanks to Internet. Since then, I have become a psychoanalyst and I have studied Parapsychology in depths as well as having been submitted to batteries of psychic ability tests in parapsychology institutes run by psychology and psychiatry Phd, with revealed strong capacities of mine. I have now both scientific background and approach as well as 20 years of yogic practice and experience, I am also well rooted in my Celtic European tradition line. I would be very interested to get in contact with you if you can please post a contact email address, regarding this old experience and the rediscovery of Carvaka which happened through my inquiries for almost 3 decades now. With regards.